What makes a good B2B salesperson? Is it the most tenacious, who never gives up until they get the sale? Is it the one who reacts faster to solve a customer's problems? Is it the über-confident lone wolf? Or is it the one who focuses on relationships, making all the right human connections? Many of us would say its this final one, the relationship-builder – especially in long cycle B2B sales. In fact, however, it's none of these. The best salespeople – and, to be clear, by this I mean the most successful in generating actual sales – are the ones who challenge their customers' thinking and assumptions. In probably the most comprehensive study of sales force effectiveness (over 6,000 salespeople across 90 companies), the Sales Executive Council has examined just what separates star performers from average ones – and to put this in perspective, we're talking about star performers who in complex, considered-purchase environments are out-performing the average by almost 200%. 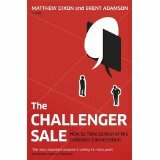 The results have been published in The Challenger Sale (which I wholeheartedly recommend). The research found that Challengers are by far the most likely to make up the star performing group (39%). The least likely? Our friends the relationship-builders (making up just 7% of star performers). "Surveys of customers consistently show that they put the highest value on salespeople who make them think, who bring new ideas, who find creative and innovative ways to help the customer's business." "What sets the best suppliers apart is not the quality of their products, but the value of their insight—new ideas to help customers either make money or save money in ways they didn't even know were possible." So we can see, success lies, first and foremost, in having a business-focused conversation with prospects. A conversation that takes their thinking in new and interesting directions. These findings could (and should) have a massive effect on how we approach B2B content marketing. Companies may be creating great thought-leadership content to feed the top of the funnel. They could also be developing process-focused mid-funnel content to lead prospects toward becoming marketing qualified or sales accepted leads. But, all too often, they then simply throw these leads over the wall for sales to do their product thing. Job done. "The thing that sets Challenger reps apart is their ability to teach customers something new and valuable about how to compete in their market." Content marketing can help salespeople succeed in every one of these areas. It can bring out your unique strengths in a way that's totally focused on what they mean for your customers' business success. It can help your salespeople with business-level insight they can use to have more profitable and effective conversations. If it is what we call active content, it can naturally lead them on to the next action in the sales cycle. And as a methodology, it can scale across segments and markets so that your salespeople do not have to reinvent the wheel every time they go in to a new meeting. While most of the thinking around B2B content marketing focuses almost exclusively at the marketing end of the spectrum, it's about time we all focused a bit more on the sharp end of sales.